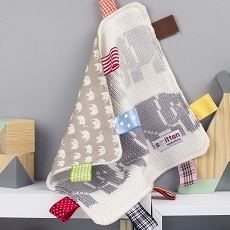 Contemporary handmade baby comforter with a knitted front featuring a taupe and soft grey elephants motif, backed in carefully selected elephant printed woven fabric and edged in a variety of textured ribbon tags. For a unique personalised baby gift, Smitten comfort blankets can be customised with a name, initials or date of birth (up to 7 characters). If you would like a personalised baby comforter please select ‘personalised’ from the drop down menu and enter your required text in the box. If you would like to customise your comfort blanket with more than 7 characters, please contact us to discuss your requirements. Your chosen text will be knitted integrally on the front of the comforter in duck egg blue. Smitten knitted comforters can be machine washed on a wool cycle up to 40 degrees. Iron if necessary on the reverse woven side.